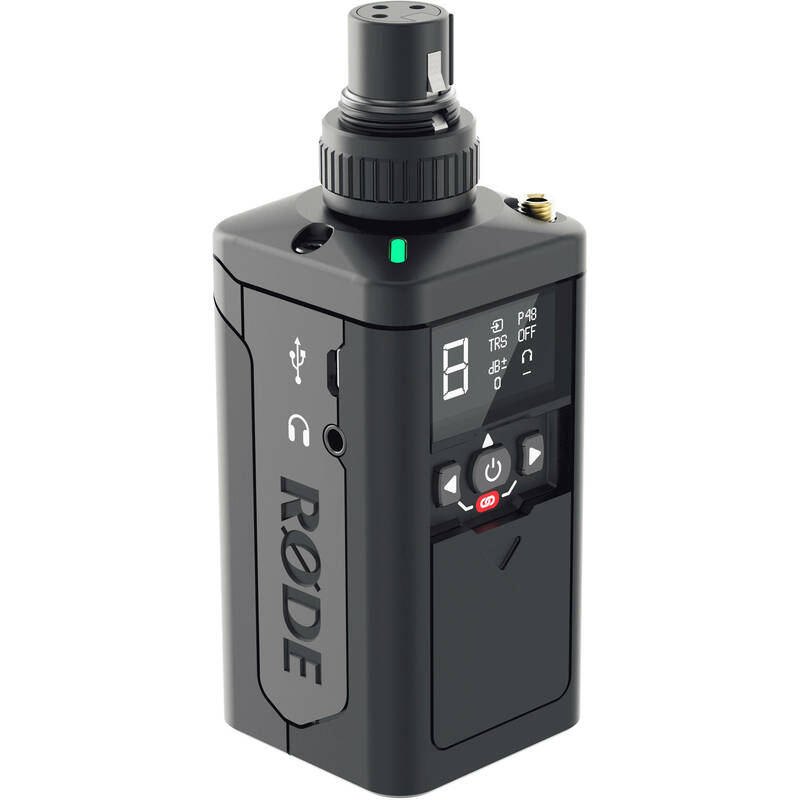 The TX-XLR from Rode is a wireless XLR transmitter for the RodeLink digital wireless system (available separately). It can be used to provide one-touch sync with your wireless system, is capable of supplying 48V of phantom power for microphones through its XLR input, and plug-in power through its TRS input. The TX-XLR sports an OLED panel, as well as an XLR input with a locking collar and a 3.5mm TRS locking input jack. This allows you to use various input configurations; though the TX-XLR can switch between its XLR and TRS inputs, you cannot use both at the same time. Whichever input you choose, you can power the unit with two AA batteries, a Sony NP-F battery, or even continuously via a micro-USB connection. While the unit will run up 7 hours, please note that activating phantom power will reduce the usable running time, depending on the power source you're using. The unit comes with a built-in internal antenna. Box Dimensions (LxWxH) 6.9 x 4.9 x 2.6"
TX-XLR Wireless Transmitter is rated 3.9 out of 5 by 10. Rated 5 out of 5 by Daniel S. from A winner! I purchased this unit because I already own the lav and camera receiver. I like that they include a cover for it and that it has the ability to hook in headsets to monitor the input. I'm not real keen on the idea that if I have a lav on channel 3 I should put this unit on channel 4 and do a switch back and forth. My other units simply require that one be turned off if using the other transmitter or you get static, but I can live with this. The unit is well built and well thought out. Keep building them like this Rode and I will keep buying from you. Rated 1 out of 5 by Justen from Defective Product - Don't waste your money I purchased a TX-XLR to pair with the RX receiver of the Rode Filmmaker set and immediately ran into issues. The mics would not pair despite following all of the trouble shooting info in the manual and on the Rode site. Both transmitter and receiver would attempt to pair, only for the TX-XLR to display a "U" forcing you to reboot the transmitter pack. No one seems able to provide a solution, so the product is being returned.? Additionally I was not able to power the TX-XLR with double AA batteries as advertised. Using two brand new Energizer lithium Ion batteries that Rode recommends in the manual would not allow the TX-XLR to power up. I could only get power to the unit using Sony NP-F batteries. Save yourself a headache and buy another wireless mic set not manufactured by Rode. Rated 5 out of 5 by David from Get this instead of the Lav Bodypack A few months ago i was deciding between the broadcaster pack vs the lav pack. Since my jobs warranted the lav, I bought two systems. (great systems btw) These packs were $100 more per system. I know now why. Because they offer not only the XLR mic option, but also a 3.5mm trs option. TWO MIC OPTIONS IN 1!!! You can't go wrong with Rode. Rated 4 out of 5 by Jason R. from Works Great! I bought a TX-XLR in addition to my three sets of Rodelink wireless TX/RX’s of their filmmakers kit. Once synced, it works as well as the Rodelink TX bodypacks and is as easy to operate, but with a few additional features. I could buy two more to accomodate my other two Rodelink receivers. I haven’t officially tested it but, whilst supplying phantom power, it runs for at least an hour on regular Eneloop AA batteries. It also comes with a custom pleather belt clip holster so no need to purchase one. Rated 5 out of 5 by Travis from Fantastic!! This TX works wonderfully, and has exceptional features! The headphone port right on the TX is truly amazing, and greatly simplifies the setup. The ability for boom op to plugin without an additional device or additional wireless feedback really changes the game. We also love the fact that we can throw Sony batteries in this- which is great when running phantom power to our shotgun mic. Rated 5 out of 5 by Keith from Rode you guys are saints! One of my new favorite tools I own. Recorded two sessions of voice overs on this thing for a client. The location we used didn't have XLRs available and this thing saved me. This combined with a Zoom H6 and a XLR splitter going into your Rodelink receiver...glorious combination. Rated 5 out of 5 by Stephen from Awesome Transmitter I added this to my moviemaker set and it connected flawlessly. I works great with my Shure SM63L. The audio sounds awesome and I have not had any audio drop-outs. I love the fact that I can power it with a Sony NP-F.
With this new TX-XLR, the RODElink newssooter can be converted to dual system ?Con este nuevo TX-XLR, el RODElink newsshooter se puede convertir en un sistema dual ? The RodeLink digital wireless system series cannot be converted to a dual channel system. The Sennheiser ME 2-II Omnidirectional Lavalier Microphone, B&amp;H # SEME2II; or the Senal OLM-2 Lavalier Microphone with 3.5mm Connector, B&amp;H # SEOLM2 are recommended lavalier microphones for the Rode TX-XLR Wireless Transmitter, when used with the required Rode RX-CAM Wireless Receiver. I own a Canon HFG-30 camcorder with the mini-plug audio input. What do I need in addition to this new Rode TX-XLR wireless transmitter to convert the Rode Reporter mic to a wireless outfit for my needs? I see this transmitter includes a locking 3.5 mm jack (presumably for a lavalier microphone?). If that is the case, then why in the world would Rode do that when they have a more appropriate belt pack transmitter for lavaliers? The gain may be adjusted up to +40dB. Is it possible to send 1/8 lav input to pan left and XLR to pan right? Or does it get sent to the receiver as a mono signal? The TX-XLR from Rode allows for users to select either the 1/8 trs input, or the xlr; not both. Does this support 24bit 48Hz?? The TX-XLR will only support an analog mic level input signal via the XLR or 3.5mm mini input. Does it come with the belt clip holster? As others have said, it comes with a leather-like cover that can be used as a clip.